I just wanna break the rules - Sugar, Darling? No-one is going to be surprised that I have this dress. 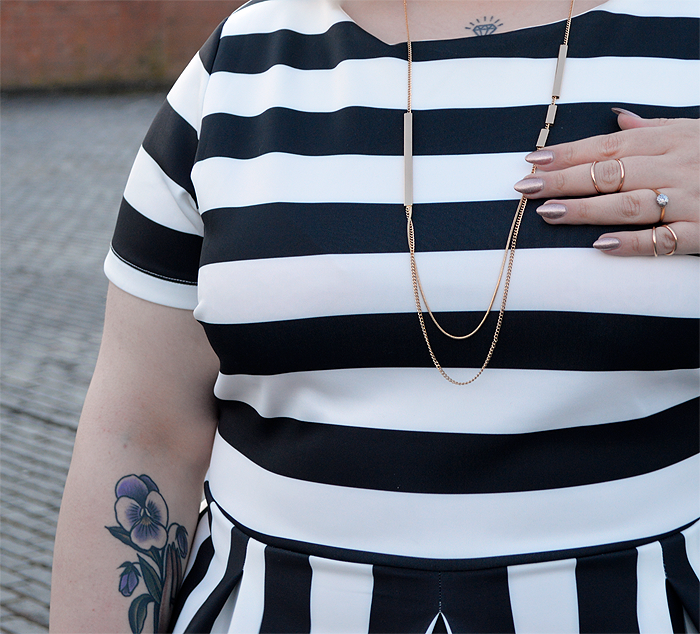 It's a well known fact that black and white stripes are my jam, so obviously this baby went straight into my wardrobe. My reasoning for the purchase was that I could wear it when we go to Alcatraz in May when we're in SF, but I knew it was really to fuel my stripe obsession. Obsession aside this is a lovely dress, made of nice stretchy scuba fabric that holds its shape and emphasises the lovely pleats at the waist. The short sleeves and cute and I love the high neckline as it means I can wear a multitude of necklaces to break up the bold pattern. As all skater dresses are I feel this is a little too short for me to happily wear with just tight or bare legs but unless you're 5'7''/5'8'' ish like me you should be just fine, and I'm happy to wear leggings underneath. As for the fit I think the sizing is true, but you may wish to size up if you have a bigger bust than little old me. 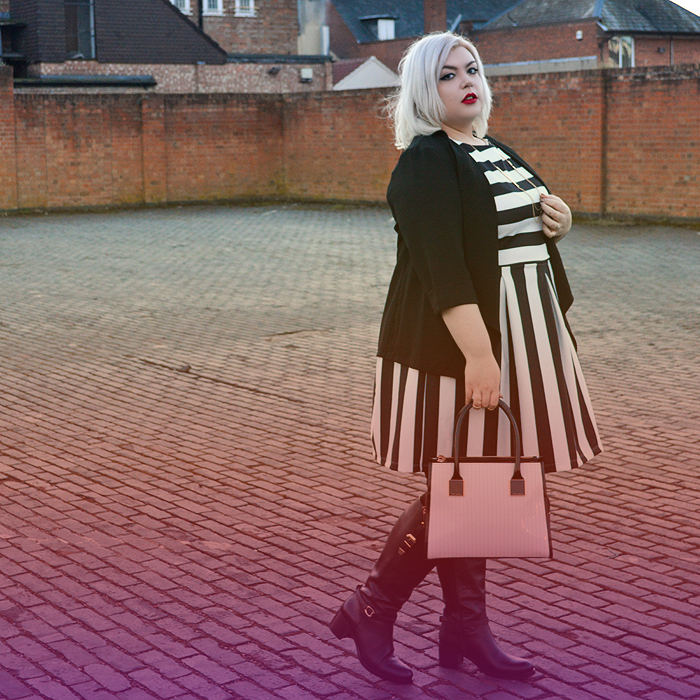 I adore how this dress looks on its own but I also wanted to show how versatile and smart a striped piece can look, that this print isn't just for carnivals and teenage goth girls like some may think. I simply threw a black crepe blazer over the top and the outfit was immediately transformed into a tres chic ensemble more than suitable for the office. 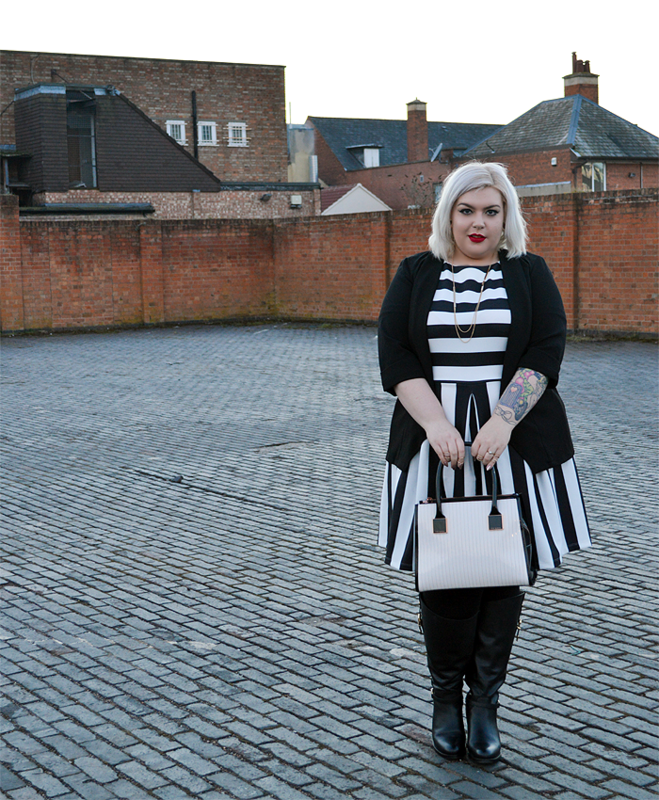 If you're not a monochrome fan you can also add in any colour you fancy, it really is a very versatile piece. 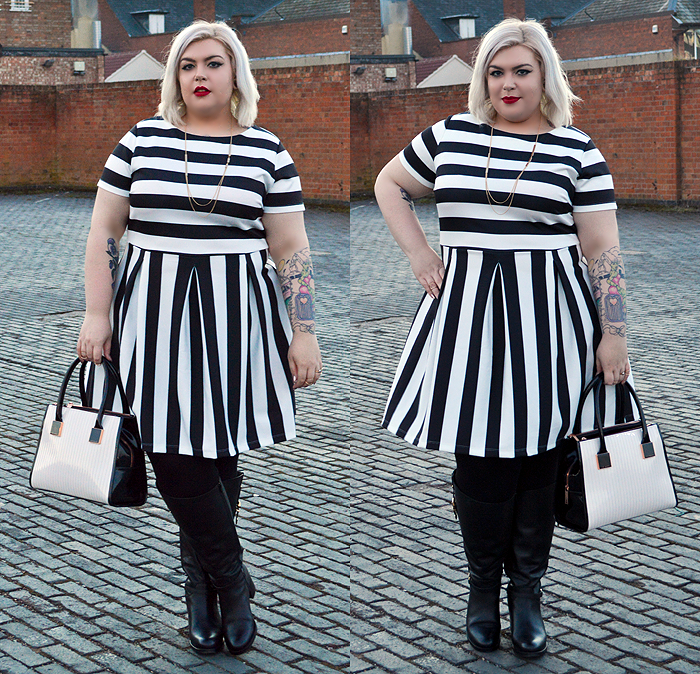 Another outfit proving that fat chicks can rock stripes just as well as anyone else - vive la stripe!